AdaptiveU is poised to become the go-to solution for employee onboarding and training, ideal for start-ups and businesses with a remote workforce. On March 16th, Team AdaptiveU participated in the Learning Solutions Conference & Expo (LSCON) in Orlando, Florida. The expo attracted pioneers of the online learning industry and e-learning enthusiasts near and far. This was the first time that AdaptiveU was showcased to a huge gathering and Team AdaptiveU enjoyed every moment in the limelight, while AdaptiveU received a highly positive response from the crowd. The Expo included 66 LMS vendors exhibiting their products. 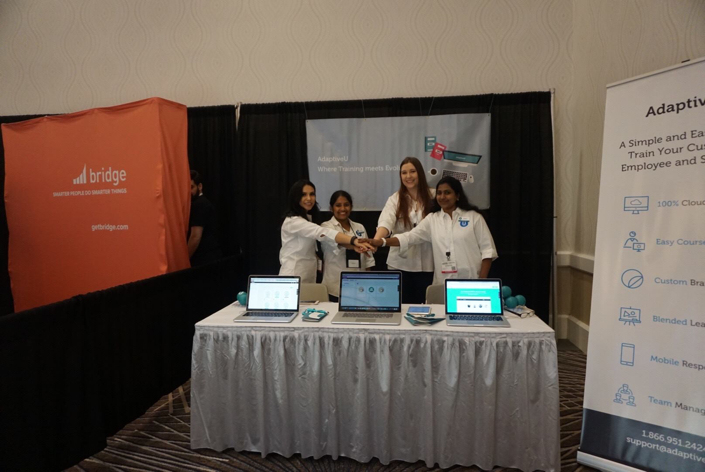 Team AdaptiveU was comprised of Saranya Kannan (Product Owner), Lucy Zarazua (Trainer at Full Creative), Ciara Sellars (Trainer at Full Creative) and Sabitha Thanmmaneni (Module Lead and AdaptiveU user). 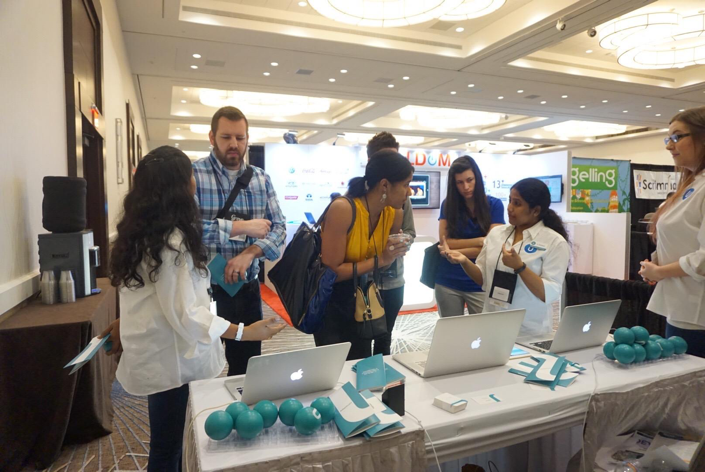 The theme for this year’s LSCON was “Sharing That Works” and brought collective minds to share their ideas on innovative solutions based on current learning trends and demands. Saranya, along with Lucy and Ciara, hosted a seminar on Training from Anywhere and told the story of the genesis of AdaptiveU. It started out as an in-house training app and soon turned into a fully-fledged LMS platform that was nimble enough to be used by a wide range of industries. You can check out the video of the entire session here. The team also actively engaged with the seminar participants to clear up doubts and share some business insights. AdaptiveU marked its debut in this year’s LSCON, establishing its presence at Booth 601. Among existing vendors, the team was able to showcase how AdaptiveU could change the way training is delivered to workforces everywhere. Learning enthusiasts filled AdaptiveU’s booth and took home some awesome gifts and trinkets to remember the experience. Ciara recalls that AdaptiveU received encouraging reviews for its overall look and user-friendly interface. They come seeking guidance. AdaptiveU has the answers. As time passed by, the momentum never really slowed down with more visitors staying at the booth for a longer period of time. Lucy says that the greatest feedback she received was when a learning enthusiast, who was scouting for a training platform, was pleased that there were developers available to get to specific details of the product. Experience gives us a perspective of what the world wants. Saranya had the experience of a lifetime by interacting with like minds at the expo. The team also had a great time at the expo and is now back at home base to execute the next phase of AdaptiveU’s mission. Stay tuned for more incredible features on the horizon that are designed to make things easier while amplifying the fun factor of any training.